The latest major update of the Google Maps app for Android and iOS added incident reports and many people wondered if the data was obtained from Waze, a service acquired by Google in June. Google used other providers, but it now also uses Waze data. "Users of Google Maps for Mobile will now benefit from real time incident reports from Waze users. This means when Wazers report accidents, construction, road closures and more on Waze, the updates will also appear on the Google Maps app for Android and iOS in Argentina, Brazil, Chile, Colombia, Ecuador, France, Germany, Mexico, Panama, Peru, Switzerland, UK and the US," informs Google LatLong. 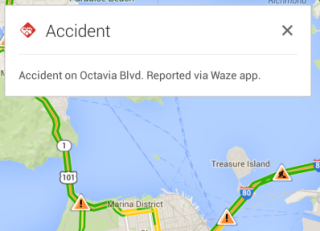 Google Maps only shows this message next to the traffic incident: "reported via Waze app". Waze added some Google features: local search results powered by Google Maps, Google Street View and Google satellite imagery in Waze Map Editor. "Waze users report millions of blockages and accidents per month. 'I think it will have a pretty big impact,' said Brian McClendon, VP of Google Maps. 'A big fraction of GMM users will see these.' As McClendon described it in an interview Monday, Waze will continue to be focused on two core things: its community, and helping people who commute. As for Google Maps' perceived strengths? Those are search, exploring, finding businesses around you, and offering more imagery, according to McClendon," reports AllThingsD. Will Waze continue to exist as a standalone app? That's obvious. Google could have easily added a "report incident" feature to Google Maps, but not many people would have used it. It takes a lot of time to foster a community of people that manually add data. Google usually obtains data automatically. For example, the Google Maps traffic feature uses aggregated data from users. "Your phone sends anonymous bits of data back to Google describing how fast you're moving. When we combine your speed with the speed of other phones on the road, across thousands of phones moving around a city at any given time, we can get a pretty good picture of live traffic conditions". Panoramio is a similar service acquired by Google and it still exists after so many years. Panoramio's high-quality photos are added to Google Earth and Google Maps.